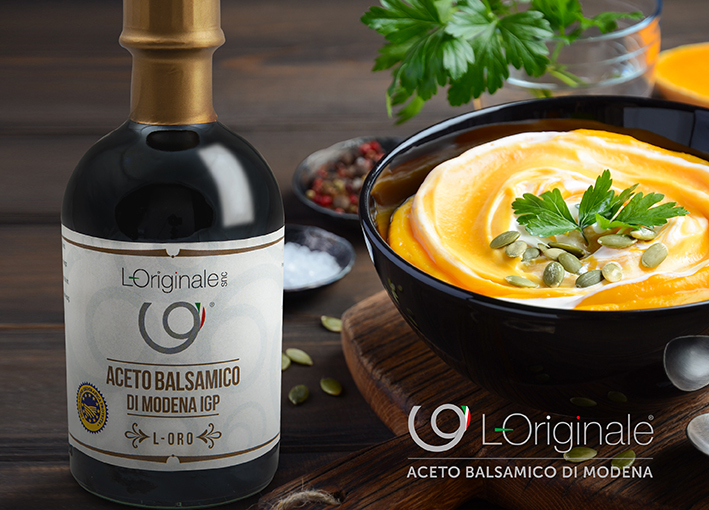 Today we propose you a tasty winter recipe: L-O’s chicken with Balsamic Vinegar glaze and pumpkin puree. Original Balsamic Vinegar glaze is recommended for the preparation of roasted meat, fish or hot sauces. Enjoy! Let’s start by pre-heating the oven at 180 ° degrees. Then heat the honey in a bain-marie to make it more liquid. At this point mix it with red wine, Traditional Balsamic Vinegar, sugar, and the previously crushed garlic clove. Add salt and pepper the chicken pieces. Cover with baking paper a low and large pan and lay the chicken. Then cover the chicken pieces with the sauce you have just prepared. Cook the chicken in the oven for at least 50 minutes, soaking it at least every 10 minutes with the sauce so that it does not dry during cooking. In the meantime, peel the potatoes, cut them into cubes together with the pumpkin and cook in steam. Once the vegetables are tender, mash them with a potato masher. Then mix the puree obtained with the cream, season with salt, pepper and nutmeg. Keep warm. Once the chicken is ready, remove it from the oven, moisten it with its sauce and let it rest for 10 minutes. At this point sprinkle it with thyme leaves and serve it with the freshly prepared pumpkin puree. The dish is ready to be enjoyed! Check our blog for many other tasty recipes!